Mickey's head is on top of his shorts! THE cookie jar for Disney fans. Collectible cookie container measures about 11 1/2-inches tall. You might ask yourself why Mickey's head is on top of his shorts, but then you remember that you don't care because those shorts are full of cookies. 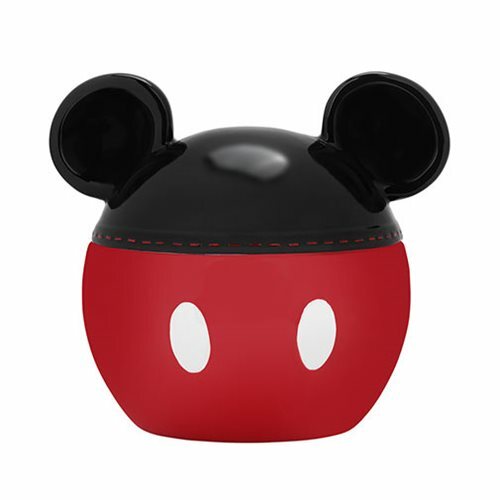 The Mickey Mouse Sculpted Ceramic Cookie Jar is a beautiful and uniquely crafted container that can also be used to hold a variety of household items. From kitchen to home organization to a fan's favorite conversation starter, this is THE cookie jar for the dedicated Disney fan. It measures 11 1/2-inches tall and comes in a color gift box. Hand wash only. Not dishwasher safe.